Companies in the U.S. are beginning to empty their deep pockets and boost capital spending as they look past the specter of sequestration and global growth risks. Orders for capital goods excluding aircraft and military equipment — an indicator of future business investment — increased 1.5 percent in May, a third consecutive advance and the longest streak since October 2011. Chief executive officers are more optimistic about the economy, based on the Business Roundtable’s quarterly outlook index, which rose to 84.3 in the second quarter, the highest in a year. Spending on information technology is up 4 percent this year compared with 2 percent last year, according to the median in asurvey of 203 businesses by Computer Economics, a research company in Irvine, California. …Such increases are set to bolster the U.S. expansion between now and year-end as companies unleash cash from their record-high balance sheets amid a brighter economic outlook. Job gains that beat expectations in June have helped firm market projections of a September start for the Federal Reserve to begin reducing its unprecedented $85 billion in monthly asset purchases, indicating confidence that growth is sustainable without record levels of monetary stimulus. This is exactly what Market Monetarists said would happen if the Federal Reserve eased monetary policy within a rule based framework. This in my view is a pretty clear demonstration of how the monetary transmission mechanism works. Lets assume that this new central bank governor is credible and market participants believe him. Lets call him Ben Volcker. 1) Consumers who have been hoarding cash because they where expecting no and very slow growth in the nominal income will immediately reduce there holding of cash and increase private consumption. 2) Companies that have been hoarding cash will start investing – there is no reason to hoard cash when the economy will be growing again. 3) Banks will realise that there is no reason to continue aggressive deleveraging and they will expect much better returns on lending out money to companies and households. It certainly no longer will be paying off to put money into reserves with the central bank. Lending growth will accelerate as the “money multiplier” increases sharply. 4) Investors in the stock market knows that in the long run stock prices track nominal GDP so a promise of a sharp increase in NGDP will make stocks much more attractive. Furthermore, with a 5% path growth rule for NGDP investors will expect a much less volatile earnings and dividend flow from companies. That will reduce the “risk premium” on equities, which further will push up stock prices. With higher stock prices companies will invest more and consumers will consume more. I think that is exactly what is now happening in the US economy. The fed’s de facto announcement back in September last year of the Bernanke-Evans rule is moving the US economy from a “bad equilibrium” to a “good equilibrium”. Hence, it is not only in the increase in the money base, which is lifting the US economy out of the crisis, but also a marked shift in expectations among US investors and consumers. It is the Chuck Norris effect. At least that is what the survey mentioned above indicates. Furthermore, this is a clear demonstration of the Sumner Critique – the fiscal multiplier will be zero if the fed follows a clear nominal target. Hence, any fiscal tightening will be offset by monetary easing and/or expected monetary easing. So while fiscal policy contracts investments and private consumption is expanding. I am still puzzled that it took the fed four years to figure this out and I should say that the Chuck Norris effect could have been much more powerful had the Federal Reserve been a lot more clear about its objectives. Now investors and consumers are still to a large extent guessing what the fed is targeting. Had the fed announced an NGDP level target then I am sure we would have seen an even stronger recovery in US capital spending. I fundamentally think that what really sets Market Monetarism aside from other macroeconomic schools it how we see the monetary transmission mechanism. I this blog post I will try to describe how I think the monetary transmission mechanism would look like in a ‘perfect world’ and how in such a perfect world the central bank basically would do nothing at all and changes in monetary conditions would be nearly 100% determined by market forces. No monetary regime is perfect, but I think the regime that get closest to perfection (leaving out Free Banking) is a regime where the central bank targets the nominal GDP level and implement this target with the use of an NGDP-linked bond. How would this work? Well imagine that the government – lets say the US government – issues bonds linked to the NGDP level. So if the market expectation for the future NGDP level increases the price of the bond increased (and yields drop) and similarly if the NGDP expectation drops the bond price will decline. Now imagine that the central bank announces that it will always buy or sell these bonds to ensure that the expected NGDP level is equal to the targeted NGDP level. Then lets now imagine that the price of the bond rise is reflecting expectations for a higher NGDP level. If the expected NGDP level increases above the targeted NGDP level then the central bank will “automatically” go out and sell NGDP-linked bonds until the price is pushed down so the expected NGDP level is equal to the targeted level. This means that the central bank will automatically reduce the money base by a similar amount as the amount of bond selling. The drop in the money base obviously in itself will contribute to pushing back the NGDP level to the targeted level. It don’t take a genius to see that the mechanism here is very similar to a fixed exchange rate policy, but the outcome of the policy is just much better than what you would get under a fixed exchange rate policy. And similarly to under a fixed exchange rate regime the money base is endogenous in the sense that it is changed automatically to hit the NGDP target. There is no discretion at all. It is not only the supply of money, which will be endogenous in a perfect world – so will the demand for money be. In fact it is very likely that most of the adjustments in this world will happen through changes in money demand rather than through changes in the money base. The reason for this is that if the NGDP targeting policy is credible then investors and consumers will adjust the demand for money to ‘pre-empt’ future changes in monetary policy. Hence, let imagine a situation where NGDP growth for some reason start to slow down. This initially pushes market expectations for future NGDP below the targeted level. However, this will only be short-lived as forward-looking investors will realise that the central bank will start buying NGDP-linked bonds and hence increase the money base. As investors realise this they will expect the value of money to go down and as forward-looking investors they will re-allocate their portfolios – buying assets that go up in value when NGDP increases and selling assets that go down in value when this happens. Assets that go up in value when NGDP expectations increase includes shares, real estate and of course NGDP-linked bond and also the national currency, while regular bonds will drop in value when NGDP expectations increase. This is key to the monetary transmission mechanism in the ‘perfect world’ – it is all about consumers and investors anticipating the central bank’s future actions and the impact this is having on portfolio reallocation. Similarly there is also an impact on macroeconomic variables due to this portfolio reallocation. Hence, if NGDP drops below the targeted level then rational consumers and investors will realise that the central bank will ease monetary policy to bring NGDP back on track. That would mean that the value of cash should be expected to decline relative to other assets. As a consequence consumers and investors will reduce their cash holdings – and instead increase consumption and investment. 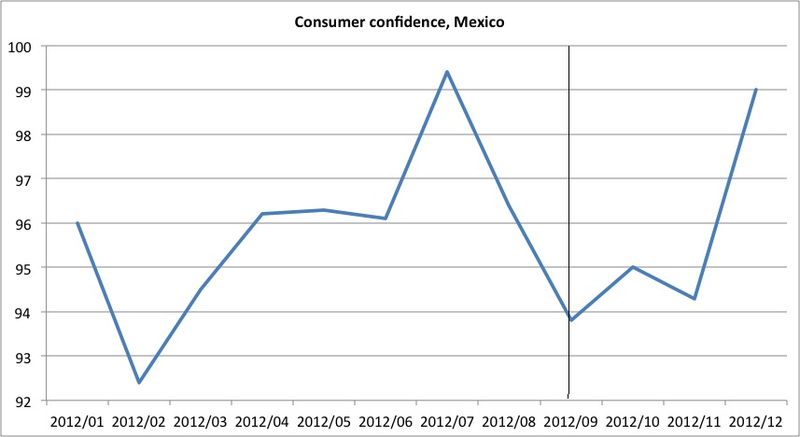 Similarly as monetary easing is expected this will tend to weaken the national currency, which will boost exports. Hence, the “NGDP anchor” will have a stabilizing impact on the macro economy. Therefore, if the central bank’s NGDP targeting regime is credible it will effectively be the market mechanism that automatically through a portfolio reallocation mechanism will ensure that NGDP continuously tend to return the targeted NGDP level. We can see in the ‘perfect world’ the money base would likely not change much and probably be closed the ideal of a ‘frozen money base’ and the continuously adjustment in monetary conditions would happens by changes in the money demand and hence in money-velocity. It should also be noted that the way I describe the transmission mechanism above interest rates play no particularly important role and the only thing we can say is that interest rates and bond yields will tend to move up and down with NGDP expectations. However, the interest rate is not the policy instrument and interest rate is just one of many prices that adjust to changes in NGDP expectations. The discussion above might seem somewhat like science fiction, but in fact I believe the way I describe the transmission mechanism above is very similarly to how the transmission mechanism actually was working during the Great Moderation from the mid-1980s to 2007/8 particularly in the US. Effectively the Fed during this period targeted 5-5½% NGDP growth and that “target” was highly credible – even though it was never precisely defined. Furthermore, the NGDP “target” was not implemented by utilizing NGDP-linked bonds and officially the fed’s used the fed funds target rate to implement monetary policy. However, the reality was that it was the market that determined what level of interest rates that was necessary to hit the “target”. Hence, only very rarely did the fed surprised the market expectation for changes in the fed fund target rate during that period. Furthermore, it was basically a portfolio reallocation mechanism that ensured NGDP stability – not changes in the fed funds target rate. So when NGDP was above ‘target’ investors would expect monetary tightening – that would cause market interest rates rise, stock prices to drop and the dollar to strengthen as future monetary tightening was priced in. In this process the demand for money would also increase and hence the velocity of money would decline. So the real achievement of monetary policy in the US during the Great Moderation was effectively to create a credible NGDP targeting regime where monetary policy basically was market determined. The problem of course was, however, that this was never acknowledged and equally problematic was the reliance on the fed funds target as the key monetary policy instrument. This of course turned out to be catastrophic defects in the system in 2008. In 2008 it was very clear that NGDP expectations were declining – stock prices was declining, bond yields dropped, the dollar strengthened and money velocity declined. Had there been a futures based NGDP targeting regime in place this would likely have lead to the price of NGDP linked-bonds to drop already in 2006 as US property prices peaked. As the fed would have pledged to keep NGDP expectations on track this would have led to an automatic increase in the money base as the fed would have been buying NGDP-linked bonds. That would have sent a clear signal to consumers and investors that the fed would not let the NGDP level drop below target for long. As a consequence we would not have seen the massive increase in money demand we saw and even if it that had happened the supply of money would have been completely elastic and the supply of dollars would have risen one-to-one with the increase in money demand. There would hence have been no monetary contraction at all. Instead the system ‘broke down’ as the fed funds target rate effectively hit the Zero Lower Bound (ZLB) and the fed effectively became unable to ease monetary policy with its preferred monetary policy instrument – the fed funds target rate. Obviously in the ‘perfect world’ there is no ZLB problem. Monetary policy can always – and will always – be eased if NGDP expectations drop below the targeted NGDP level. In the ‘perfect world’ the fiscal multiplier will always be zero. To understand this try to imagine the following situation. The US government announces that government spending will be cut by 10% of GDP next year. It is pretty obvious that the initial impact of this would for aggregate demand to drop. Hence, the expectation for next year’s NGDP level would drop. However, if NGDP expectations drop below the targeted level the fed would automatically expand the money base to ‘offset’ the shock to NGDP expectations. The fed would likely have to do very little ‘offsetting’ as the market would probably do most of the work. Hence, as the fiscal tightening is announced this would be an implicit signal to the market that the fed would ease monetary policy. The expectation of monetary easing obviously would lead to a weakening of the dollar and push up stock prices and property prices. As a consequence most of the ‘offsetting’ of the fiscal tightening would be market determined. We should therefore, expect money demand to drop and velocity increase in response to an announcement of fiscal tightening. As an aside it should be noticed at this is the opposite of what would be the case in a paleo-keynesian world. Here a tightening of monetary policy would lead to a drop in money-velocity. I plan to return to this issue in a future post. The important point here is that in the ‘perfect world’ there is no room or reason for using fiscal policy for cyclical purposes. As a consequence the there are no argument as consolidating fiscal policy is long-term considerations necessitate this. I think my conclusion above clearly demonstrates what is the ‘core’ of Market Monetarist thinking. So while Market Monetarism often wrongly is equated with ‘monetary stimulus’ and advocacy of ‘quantitative easing’ the fact is that this really has nothing to do with Market Monetarism. Instead what we are arguing is that monetary policy should be ‘market determined’ by the use of targeting the price of NGDP-linked bonds. In such a world there would be no ‘stimulus’ in the sense that there would be no need for discretionary changes in monetary policy. Monetary conditions would change completely automatically to always ensure NGDP stability. As a consequence monetary conditions would likely mostly change through changes in money demand rather than through changes in the money base. Therefore we can hardly talk about ‘QE’ in such a regime. So why have Market Monetarists then seemly supported quantitative easing in for example the US. Well, the point is first and foremost that the fed’s monetary policy regime over the past five years have not been entirely credible – we are getting closer, but we are very far away from the ‘perfect world’. Hence, the fed needs to undertake quantitative easing to demonstrate first of all that it can indeed ease monetary policy even with interest rates basically at zero. Secondly since monetary policy is not credible (countercyclical) changes in money demand will not happen automatically so the fed will instead have to change the money base. Obviously these measures would not be necessary if the US Treasury issue NGDP-linked bonds and the fed at the same time announced an NGDP level target and utilized the NGDP-linked bonds to hit this target. If such a system were credibly announced then it would be very hard to argue for ‘monetary stimulus’ and quantitative easing in the discretionary sense. It might be that the discussion above is pure fantasy and it is pretty clear that we are very, very far away from such a monetary policy regime anywhere, but I nonetheless think that the discussion illustrates how important it is for monetary policy to be rule based rather than to be conducted in a discretionary fashion. Both the Bank of Japan and the Federal Reserve have within the last six months moved (a little) closer to the ‘perfect world’ in the sense that their policies have become a lot more rule based than used to be the case and there is no doubt that the policies are ‘working’. Especially in the case of Japan it seems clear that ‘automatic’ adjustments in money demand is going to play a very key role in achieve BoJ’s 2% inflation target. Hence, it is likely that it will not be the expansion of the money base that will do it for BoJ, but rather the likely sharp increase in money-velocity that will ensure that BoJ’s hits its target. Finally, I would argue that my discussion above also demonstrates why a proper NGDP level targeting regime is a true free market alternative as the system relies heavy on market forces for the implementation of monetary policy and is strictly rule base. There has been a lot of focus on the fact that USD/JPY has now broken above 100 and that the slide in the yen is going to have a positive impact on Japanese exports. In fact it seems like most commentators and economists think that the easing of monetary policy we have seen in Japan is about the exchange rate and the impact on Japanese “competitiveness”. I think this focus is completely wrong. I think that the way we should think about the weaker yen is as a indicator for monetary easing. Hence, when we seeing the yen weakeN, Japanese stock markets rallying and inflation expectations rise at the same time then it is pretty safe to assume that monetary conditions are indeed becoming easier. Of course the first we can conclude is that this shows that there is no “liquidity trap”. The central bank can always ease monetary policy – also when interest rates are zero or close to zero. The Bank of Japan is proving that at the moment. Velocity is of course picking up because money demand in Japan is dropping as a consequence of households, companies and institutional investors expect the value of the cash they are holding to decline as inflation is likely to pick up. The drop in the yen is a very good indicator of that. And what do you do when you reduce the demand for money? Well, you spend it, you invest it. This is likely to be what will have happen in Japan in the coming months and quarters – private consumption growth will pick-up, business investments will go up, construction activity will accelerate. So it is no wonder that equity analysts feel more optimistic about Japanese companies’ earnings. Hence, the Bank of Japan (and the rest of us) should celebrate the sharp drop in the yen as it is an indicator of a sharp increase in money-velocity and not because it is helping Japanese “competitiveness”. I have in numerous earlier posts argued that when a country is going through a “devaluation” as a consequence of monetary easing the important thing is not competitiveness, but the impact on domestic demand. I have for example earlier demonstrated that Swedish growth outpaced Danish growth in 2009-10 not because the Swedish krona depreciated strongly against the Danish krone (which is pegged to the euro), but because the Swedish Riksbank was able to ease monetary policy, while the Danish central bank effectively tightened monetary conditions due to the Danish fixed exchange rate policy. As a consequence domestic demand did much better in Sweden in 2009-10 than in Denmark, while – surprise, surprise – Swedish and Danish exports more or less grew at the same pace in 2009-10 (See graphs below). And if we want to go further back in history we can look at what happened in the US after FDR gave up the gold standard in 1933. Here the story was the same – it was domestic demand and not net exports which was the driver of the sharp recovery in growth during 1933. These examples in my view clearly shows that the focus on the “competitiveness channel” is completely misplaced and the ongoing pick-up in Japanese growth is likely to be mostly about domestic demand rather than about exports. Finally if anybody still worry about “currency war” they might want to rethink how they see the impact of monetary easing. When the Bank of Japan is easing monetary policy it is likely to have a much bigger positive impact on domestic demand than on Japanese exports. In fact I would not be surprised if the Japanese trade balance will worsen as a consequence of Kuroda’s heroic efforts to get Japan out of the deflationary trap. PS Scott Sumner also comments on Japan. PPS An important non-competitiveness impact of the weaker yen is that it is telling consumers and investors that inflation is likely to increase. Again the important thing is the signal about monetary policy, which is rather more important than the impact on competitiveness. I am still in Provo Utah and even though I have had a busy time I have watch a bit of Bloomberg TV and CNBC over the last couple of days (to fight my jet lag). I have noticed some very puzzling comments from commentators. There have been one special theme and that has come up again and again over the last couple of days among the commentators on US financial TV and that is that “yeah, monetary easing might be positive for the markets, but it is not have any impact on the real economy”. This is a story about disconnect between the economy and the markets. I find that perception very odd, but it seems like a lot of commentators simply are not mentally able to accept that monetary policy is highly effective. The story goes that when the Federal Reserve and the ECB moves towards monetary easing then it might do the markets good, but “real people” will not be helped. I find it unbelievable that well-educated economists would make such claims. Markets are forward-looking and market pricing is the best tool we have for forecasting the future. When stock prices are rising, bond yields are rising, the dollar is weakening and commodity prices are going up then it is a very good indication that monetary conditions are getting easier and easier monetary conditions mean higher nominal GDP growth (remember MV=NGP!) and with sticky prices and excess capacity that most likely also mean higher real GDP growth. That has always been that case and that is also the case now. There is no disconnect between the markets and the economy, but there is a disconnect between what many commentators would like to see (that monetary policy is not working) and the reality. To try to illustrate the connection between the markets and NGDP I have constructed a very simple index to track market expectations of future NGDP. I have only used two market indicators – a dollar index and the S&P500. I am constructed an index based on these two indicators – I have looked year-year percentage changes in both indices. I have standardized the indices and deducted them from each other – remember higher S&P500 means higher NGDP, but a stronger dollar (a higher USD index) means lower NGDP. I call this index the NGDP Market Indicator. The indicator has been standardized so it has the same average and standard deviation as NGDP growth since 1990. As the graph below shows this simple indicator for future NGDP growth has done a fairly good job in forecasting NGDP since 1990. (You can see the background data for the indicator here). 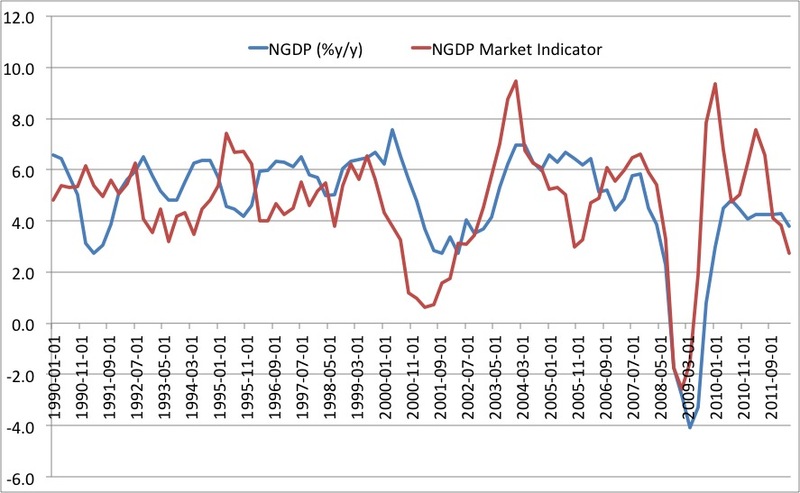 During the 1990s the indicator indicates a fairly stable growth rate of NGDP and that is in fact what we had. In 1999 the indicator started to send a pretty clear signal that NGDP growth was going to slow – and that is exactly what we got. The indicator also clearly captures the shock in 2008 and the recovery in 2009-10. It is obvious that this indicator is not perfect, but the indicator nonetheless clearly illustrates that there in general is no disconnect between the markets and the economy – when stock prices are rising and the dollar is weakening at the same time then it would normally be indicating that NGDP growth will be accelerating in the coming quarters. Having that in mind it is of course worrying that the indicator in the last couple of months has been indicating a relative sharp slowdown in NGDP growth, which of course provides some justification for the Fed’s recent action. I must stress that I have constructed the NGDP market indicator for illustrative purposes, but I am also convinced that if commodity prices and bond yields and maybe market inflation expectations were included in the indicator and the weighing of the different sub-indicators was based on proper econometric methods (rather than a simple unweighted index) then it would be possible to construct an indicator that would be able to forecast NGDP growth 1-4 quarters ahead very well. So again – there is no disconnect between the markets and the economy. Rather market prices are very good indicators of monetary policy “easiness” and therefore of future NGDP. In fact there is probably no better indicator for the monetary policy stance than market prices and the Federal Reserve and other central banks should utilize market prices much more in assessing the impact of monetary policy on the economy than it presently the case. An obvious possibility is also to use a future NGDP to guide monetary policy as suggested by Scott Sumner. During the Great Moderation it was normal to say that the Federal Reserve and the ECB (and many other central banks for that matter) was following a relatively well-defined monetary policy reaction function. It is debatable what these central banks where actually targeting, but there where is no doubt that both the Fed and the ECB overall can be descripted to have conducted monetary policy to minimize some kind of loss function which included both unemployment and inflation. In a world where the central bank follows a Taylor rule style monetary policy reaction function, targets the NGDP level, do inflation targeting or have pegged the exchange rate the markets will tend to ignore political news. The only important thing will be how the actual economic development is relative to the target and in a situation with a credible nominal target the Chuck Norris effect will ensure that the markets do most of the lifting to achieve the nominal target. The only things that could change that would be if politicians decided to take away the central bank’s independence and/or change the central bank’s target. When I 12 years ago joined the financial sector from a job in the public sector I was hugely surprised by how little attention my colleagues in the bank was paying to political developments. I, however, soon learned that both fiscal policy and monetary policy in most developed countries had become highly rule based and therefore there was really no reason to pay too much attention to the nitty-gritty of day-to-day politics. The only thing one should pay attention to was whether or not given monetary targets where on track or not. That was the good old days of the Great Moderation. Monetary policy was rule based and therefore highly predictable and as a result market volatility was very low. This have all changed in the brave new world of Great Recession (failed) monetary policy and these days it seems like market participants are doing nothing else than trying to forecast what will be the political changes in country X, Y and Z. The reason for that is the sharp increase in the politician of monetary policy. In the old days – prior to the Great Moderation – market participants were used to have politicians messing up monetary policies. Central banks were rarely independent and did not target clear nominal targets. However, today the situation is different. Gone are the days of rule based monetary policy, but the today it is not the politicians interfering in the conduct of monetary policy, but rather the central bankers interfering in the conduct of other policies. Any Market Monetarist will tell you that the expectational channel is extremely important for the monetary transmission mechanism and this is particularly important when a central bank start to include political outcomes in it’s reaction function. So I long for the days when politics was not market moves in the financial markets and I hope central banks around the world would soon learn that it is not part of their mandate to police the political process and punish governments (and voters!) for making the wrong decisions. Central banks should only target nominal targets and nothing else. If they diverge from that then things goes badly wrong and market volatility increases sharply. Finally I should stress that I am not arguing in anyway that the ECB is wrong to be concerned about fiscal policy being unsustainable in a number of countries. I am deeply concerned about that state of fiscal policy in a number of countries and I think it is pretty clear to my regular readers that I do not favour easier fiscal policy to solve the euro zone crisis. I, however, is extremely sceptical about certain political results being included in the ECB’s reaction function. That is a recipe for increased market volatility. My post on US stock markets and monetary disorder led to some friendly but challenging comments from Diego Espinosa. Diego rightly notes that Market Monetarists including myself praises US president Roosevelt for taking the US off the gold standard and that similar decisive actions is needed today, but at the same time is critical of Ben Bernanke’s performance of Federal Reserve governor despite the fact that US share prices have performed fairly well over the last four years. Diego’s point is basically that the Federal Reserve under the leadership of chairman Bernanke has indeed acted decisively and that that is visible if one look at the stock market performance. Diego is certainly right in the sense that the US stock market sometime ago broken through the pre-crisis peak levels and the stock market performance in 2009 by any measure was impressive. It might be worth noticing that the US stock market in general has done much better than the European markets. However, it is a matter of fact that the stock market response to FDR’s decision to take the US off the gold standard was much more powerful than the Fed’s actions of 2008/9. I take a closer look at that below. To illustrate my point I have looked at the Dow Jones Industrial Average (DJIA) for the period from early 2008 and until today and compared that with the period from 1933 to 1937. Other stock market indices could also have been used, but I believe that it is not too important which of the major US market indices is used to the comparison. The graph below compares the two episodes. “Month zero” is February 1933 and March 2009. These are the months where DJIA reaches the bottom during the crisis. Neither of the months are coincident as they coincide with monetary easing being implemented. In April 1933 FDR basically initiated the process that would take the US off the gold standard (in June 1933) and in March 2009 Bernanke expanded TAF and opened dollar swap lines with a number of central banks around the world. 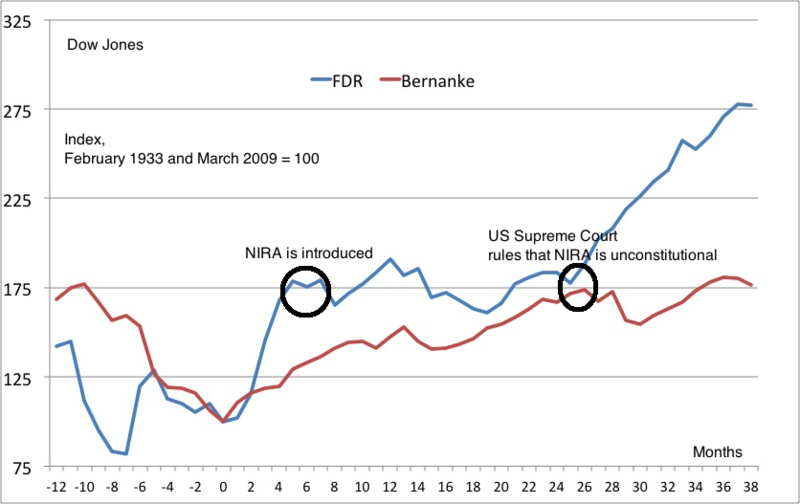 As the graph below shows FDR’s actions had much more of a “shock-and-awe” impact on the US stock markets than Bernanke’s actions. In only four months from DJIW jumped by nearly 70% after FDR initiated the process of taking the US off the gold standard. This by the way is a powerful illustration of Scott Sumner’s point the monetary policy works with long and variable leads – you see the impact of the expected policy change even before it has actually been implemented. The announcement effects are very powerful. The 1933 episode illustrates that very clearly. Over the first 12 months from DJIA reaches bottom in 1933 the index increases by more than 90%. That is nearly double of the increase of DJIA in 2009 as is clear from the graph. Obviously this is an extremely crude comparison and no Market Monetarist would argue that monetary policy changes could account for everything that happened in the US stock market in 1993 or 2009. However, impact of monetary policy on stock market performance is very clear in both years. A very strong illustration of the fact that monetary policy is not everything that is important for the US stock market is what happened from June 1933 to May 1935. In that nearly two year period the US stock market was basically flat. Looking that the graph it looks like the stock market rally paused to two years and then took off again in the second half of 1935. The explanation for this “pause” is the draconian labour market policies implemented by the Roosevelt administration. In June 1933 the so-called National Industrial and Recovery Act was implemented by the Roosevelt administration (NIRA). NIRA massively strengthened the power of US labour unions and was effectively thought to lead to a cartelisation of the US labour market. Effectively NIRA was a massively negative supply shock to the US economy. So while the decision to go off the gold standard had been a major positive demand shock that on it’s own had a massively positive impact on the US economy NIRA had the exact opposite impact. Any judgement of FDR’s economic policies obviously has to take both factors into account. That is exactly what the US stock market did. The gold exit led to a sharp stock market rally, but that rally was soon killed by NIRA. In May 1935 the US Supreme Court ruled that NIRA was unconstitutional. That ruling had a major positive impact positive impact as it “erased” the negative supply shock. As the graph shows very clearly the stock market took off once again after the ruling. Overall we have to conclude that FDR’s decision to take the US off the gold standard had an significantly more positive impact on the US stock markets than Ben Bernanke’s actions in 2008/9. However, contrary to the Great Depression the US has avoided the same kind of policy blunders on the supply side over the past four years. While the Obama administration certainly has not impressed with supply side reforms the damage done by his administration on the supply side has been much, much smaller than the disaster called NIRA. Hence, the conclusion is clear – monetary easing is positive for the stock market, but any gains can be undermined by regulatory mistakes like NIRA. That is a lesson for today’s policy makers. Central banks should ensure stable growth in nominal GDP, while governments should implement supply side reforms to increase real GDP over the longer run. That would not undoubtedly be the best cocktail for the economy but also for stock markets. Finally it should be noted that both FDR and Bernanke failed to provide a clear rule based framework for the conduct of monetary policy. That made the recovery much weaker in 1930s than it could have been and probably was a major cause why the US fell back into recession in 1937. Similarly the lack of a rule based framework has likely had a major negative impact on the effectiveness of monetary policy over the past four years. PS this post an my two previous posts (see here and here) to a large degree is influenced by the kind of analysis Scott Sumner presents in his book on the Great Depression. Scott’s book is still unpublished. I look forward to the day it will be available to an wider audience.